These are gorgeous. Thanks lots. Beautiful, Judy,and just like the cut outs on cards when we were young. These are as beautiful as ever ! Thank you so much for this post. I want to let you know that I posted a link to your blog in CBH Digital Scrapbooking Freebies, under the Page 12 post on Dec. 03, 2010. Thanks again. Just beautiful. Appreciate you sharing with us. Thank you, thank you, thank you. I just adore holly and this is absolutely beautiful. Thanks so much Judy. Your border is beautiful! 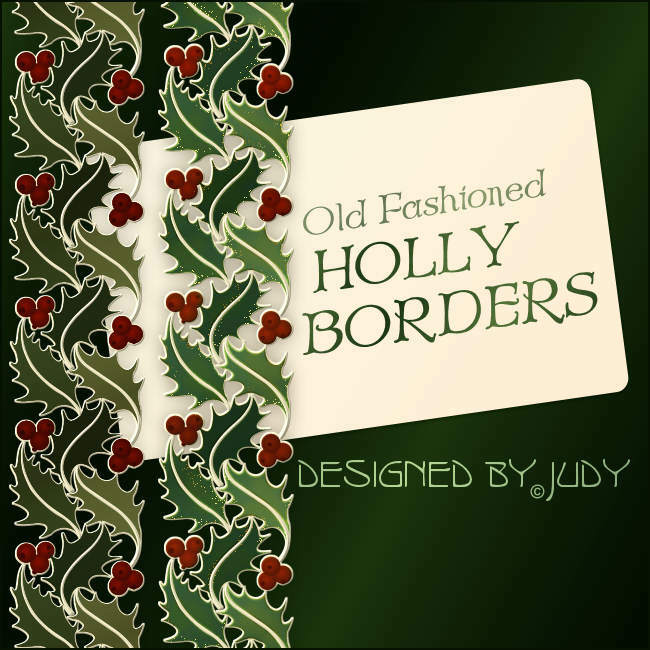 I love holly on my Christmas pages. Can't wait to use these. Thank you! Simply elegant! Thanks for sharing. Thank you for sharing these. They are very pretty. These are great...thank you so much for sharing. Thank you, they are gorgeous! Thank you very much. These are so beautiful, just like everything you create. These are really cute! Thank you! Thank you for making the holly border available. I just love it. These are so beautiful!! Thank you so much!! Really beautiful. Classy. Love them! Thanks so much for sharing! Thank you so much for the aswesome borders! Thank you for your kind gift - this border is lovely. Seasons Greetings.